First of all.. I'm new here! I hope I'm not repeating anyone! I started this regimen the evening of September 29th. So now I've done the evening regimen three times and the morning regimen twice. I had no problems the first time, however this morning I noticed when I was doing my morning routine, that there were some slight pink patches that felt kind of rough to the touch. Didn't think much of it though. This evening however when I applied the Tretinoin the patches started to get redder and warmer. The bumps/roughness are not hives, the rash doesn't itch.. it's just really warm. My face is also a bit swollen.. mostly on my cheeks where it's the most red.. it's also swollen under the sides of my jaw, I didn't apply any there. It's not bad on my forehead or nose though, again, I put it all over my face. I know that the Tretinoin can irritate and that you should expect your skin to be irritated and dry on some level. Is this normal though? For it to be swollen and hot? Is it just my skin getting used to this new thing? Should I stick it out and let it adjust? Previously I wasn't using any sort of acne treatment besides Clindamycin topical gel which I ran out of a few weeks ago. 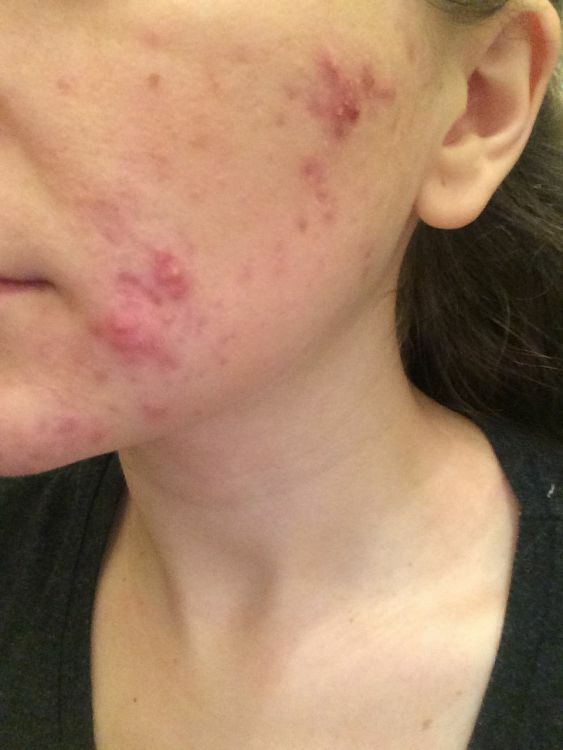 I don't think I'm allergic to Tretinoin, I mean, I used it two nights before this happened. I'm also using it on my arms for Keratosis Pilaris and the same reaction has not occurred. I do know, or suspect, that I'm allergic to Penicillin though I've never been tested for that.. I also may be allergic to another oral antibiotic starting with either an X or a Z. But I've used Clindamycin just fine. I know what an allergic reaction is like since I'm allergic to tree nuts. But yeah.. this rash is hot and slightly uncomfortable... my face is swollen on my cheeks but not really on my forehead.. it's also kind of traveling down my neck and I haven't applied any there.